I never thought that fish would be an evolutionary ancestor to humans. Monkeys and chimpanzees, yes—but fish? 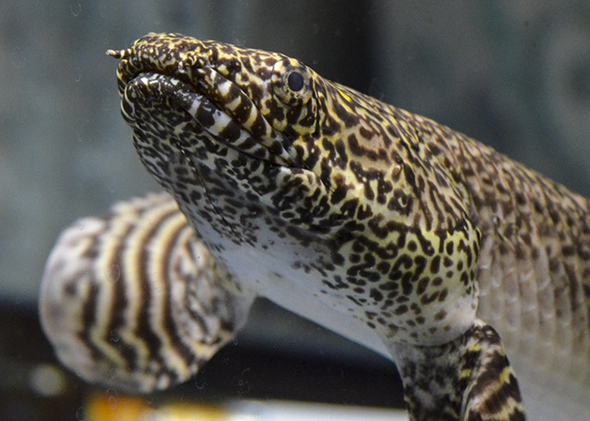 It turns out that a certain fish, known as Polypterus and related species, have tiny holes in the top of their head called spiracles. A team of researchers in California recently showed how a small valve opens a bony lid over these spiracles that allows air to be sucked in and pumped out when the fish surface. Strangely enough those same holes allowing the fish to breathe have modified themselves over time to become Eustachian tubes. Enabling us to hear, these tubes are small passageways on either side of the head that connect the upper part of the throat to the middle ear. They supply fresh air, drain fluid, and keep air pressure between the nose and the ear at a steady level. Hearing in early amphibians developed from the spiracles adapting to become the tympanic membrane (also known as the eardrum), a thin cone-shaped membrane that separates the external ear from the middle ear. The tympanic membrane is similar to skin and transmits sound to the brain through the stapes, the tiniest bone in the body. Interestingly, the stapes evolved from a long bone, known as the hyomandibular bone, that braced the lower jaws of sharks and other early jawed fish. This bone eventually shrank in size to form the stapes. The other two inner ear bones alongside the stapes—the malleus and the incus—also formed from bones that braced the articulation of the upper and lower jaws. These bones decreased in size and became restricted to the inner ear. So, these three little bones that enable us to hear derived from the larger jaw bones of ancient fish. If not for the evolutionary experiments of these prehistoric fish breathing air through the top of their heads, humans may never have evolved a keen sense of hearing. Now that you know how our hearing evolved, learn more about how hearing works and how the human ear processes sound. Watch our captioned How Hearing Works video.